This is the second part of my breakdown of the @jackcr DFIR challenge. You can find part one here. If you remember from the pcap analysis, the C2 client at 58.64.132.141 was communicating with 172.16.150.20 and after decoding the Gh0st traffic we were able to discern that the localhost name was ENG-USTXHOU-148, so that's where we will pick up. Loading the memdump.bin file into Volatility's imageinfo module confirms what we saw in the Gh0st data; this machine is running Windows XP Service Pack 3. Taking a look at the output of connscan, you can see the connection to the C2 client at 58.64.132.141. The process using that connection has a PID of 1024. Output of pstree show the process with the PID 1024 is svchost.exe so obviously we've got some trouble here. You also see that svchost.exe is the parent process of wc.exe which we saw in part one. You can dump the suspect file out using the dlldump module. ...and see if VirusTotal has seen this before. Apparently so! Ok, so we've found our backdoor. 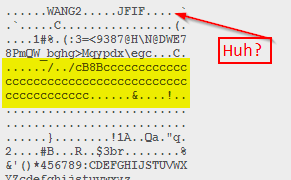 Running strings against the file also reveals a couple of instances of "Gh0st" to further confirm our suspicions. So how did this machine become compromised in the first place? I ran the entire memdump.bin file through strings and then grepped that output to look for instances of "58.64.132.141". Adding the -C flag to your grep command will give you x lines of context before and after any occurrences detected. There are several hits, but the most interesting one is listed below. What you see above is the phish that the users callb, amirs, and wrightd received. The sender address, isd@petro-markets.info, is designed to look familiar to the end users. At the end of the email we see the trojan, Symantec-1.43-1.exe. We were also given a timeline file and we can see both the execution of the trojan and creation of 6to4ex.dll A little further on, we see the same activity that we saw in the pcap file. Now we have lots of indicators to go on. I'll be making another post soon about using this information to create an IOC signature with Mandiant's IOC editor. I've been working on a DFIR challenge put out there by @jackcr over at his HandlerDiaries site and thought I would make a few posts about it for my reference more than anything else. An ids alert initially triggered on ENG-USTXHOU-148 for an established port 80 connection to a known bad ip address. Ok, so we have an established session over port 80 to a known bad. Let's open up the pcap and take a look. The command above runs the pcap through the chopshot gh0st_decode module and dumps the output to a text file. You can see in the top line where the TOKEN: LOGIN command was issued from the C2 client to eng-ustxhou-148. Let's see what else we can see. Below are my rough notes. "...small businesses believe they are immune to attacks targeted at them. However, money stolen from a small business is as easy to spend as money stolen from a large business. And while small businesses may assume that they have nothing a targeted attacker would want to steal, they forget that they retain customer information, create intellectual property, and keep money in the bank. While it can be argued that the rewards of attacking a small business are less than what can be gained from a large enterprise, this is more than compensated by the fact that many small companies are typically less careful in their cyberdefenses. Criminal activity is often driven by crimes of opportunity. With cybercrimes, that opportunity appears to be with small businesses." Just like I've always said, just because you don't have as much gold in the vault, doesn't mean you can leave it wide open. Let me be direct. Doug Burks' Security Onion distribution is nothing short of amazing. Working for a smaller organization inevitably means you end up wearing numerous hats and time to focus on any one project, much less one that management doesn't see any direct benefit from (i.e. network monitoring), can be scarce. In the past, I've had various installs of Snort, OSSEC, and OCS Inventory setup to monitor the network. But inevitably, these projects got pushed to the back-burner, became outdated, and eventually got mothballed. A year or so ago I tried Security Onion, but due to some memory issues, was never really able to make it sing. That all changed when I recently got time to try again with Security Onion 12.04. I'm still having to use it on some older hardware, but it is working wonderfully. Small business security is notoriously poor due to small budgets, low staffing, and lack of knowledge. It should come as no surprise that businesses under 250 employees are getting battered. While I may have the skills and patience to get some of these tools put in place, the time to do so is ever fleeting. That's why I think the Security Onion project is so good for small business. In under 30 minutes, the typical Windows sysadmin can "Next,Next, Finish" their way to a very powerful NSM. Check out Doug's talk at last years Derbycon for more details. A fresh IDS install is always noisy, especially on a network with lots of Windows hosts. On of the main alerts I've seen on networks with multiple sites is: GPL SHELLCODE x86 inc ebx NOOP. Should I be alarmed? Let's see. After a little analysis you notice that the vast majority of the alert traffic is ICMP between domain controllers, but the packets are relatively large at around 2000 bytes. Ok, so let's dig a little further. if you check out the payload, you'll notice the string that triggered the rule. But what's up that WANG2.....JFIF at the top. Maybe a dubious JPEG attempting to spread? Not quite. Pivoting from Sguil to NetworkMiner, you are able to extract the image and see that it's a simple logo from Microsoft. Apparently, this type of traffic is used in Slow Link Detection between clients and domain controllers when applying group policy. Ok, so we've established that it's a false positive so let's tweak the rule a little by exempting traffic containing the string WANG2 in the payload like so. I added the following to my local.rules file and disabled the original rule.